Still talking about buttons. 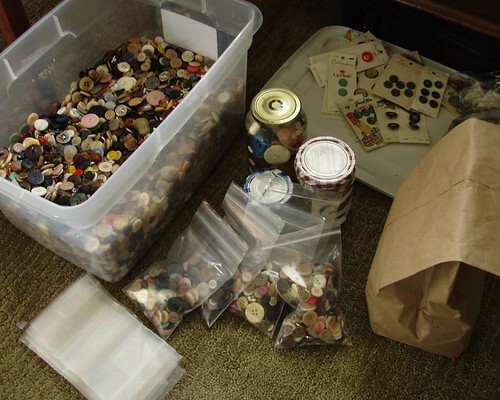 Someone told me a while ago that only crazy people have button collections. And then I thought about two groups I am a part of: the Society for Creative Anachronism and fiber artists. Both have button collections. Both could be considered crazy. 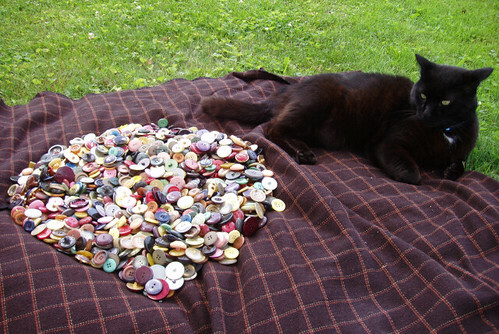 To be honest, I have a set on Flickr dedicated to buttons. It isn’t overflowing with photos, but still, it’s there. Some buttons I have had. I don’t really know what is so appealing about buttons. I’m also aware that I have far more buttons than I could ever use in my life. But it’s nice to have a large selection from which to choose. Plus they are an interesting link to the past. 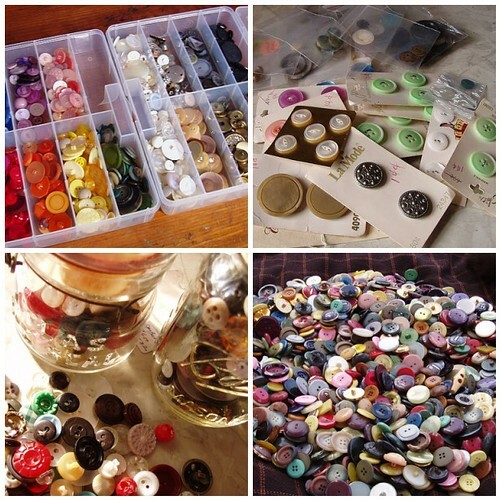 Question: How do you deal with buttons? Do you buy them for a specific project? Do you keep a collection around? Have you ever selected a project to showcase a button? How do you like to buy your buttons? A large random assortment or individually? A friend of mine passed her button collection along to me this weekend. The box was full of both loose buttons and lots of cards. 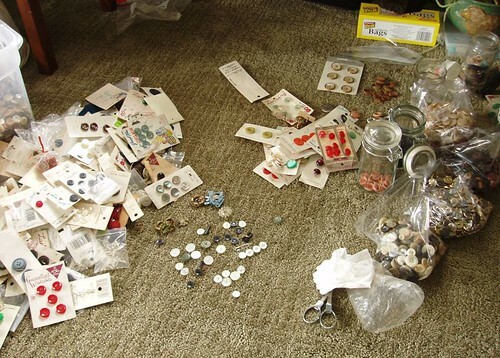 I’ve gone through the entire thing, sorting out broken buttons, non-buttons, and my favorite buttons. There are far more here than I could ever use, so I’ll be making them available at my next show, which is this weekend! whoa – a finished project! I’ll admit, and I’m sure this has been said many times before, that I am NOT a skilled multitasker. 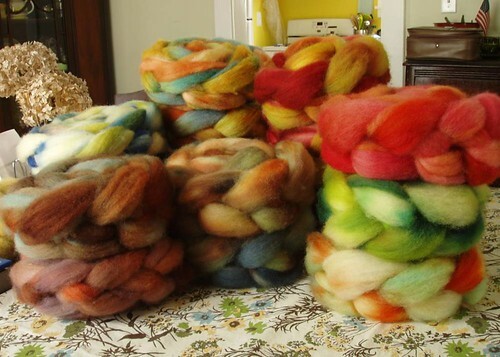 As far as my crafting goes, I find that I am either solely spinning/dyeing OR knitting, but not really both. Around Christmas all my time was spent knitting mittens, and now that I’m done with that and working towards Knitter’s Fantasy, I haven’t been knitting much at all. So these sad little mittens have been languishing since just before Christmas. They are for my niece (hehehe – I have a niece now!). 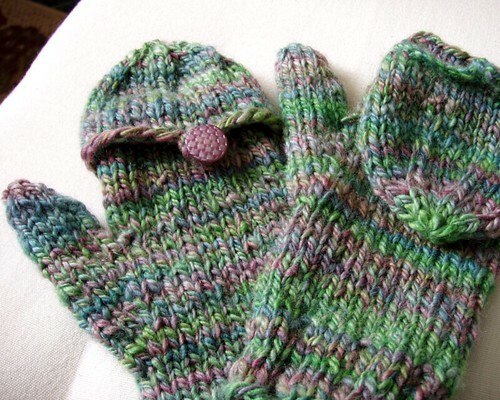 And gave me a chance to work on my flip-top mittens pattern a bit more. The stitches look so uneven, I’m hoping giving them a bath with fix that. Fiber is Blue-faced Leicester. Monday morning. I get to work unusually early. Approaching my desk, I see a large bag sitting precariously on the corner with a box sticking out the top. What is this? What kooky task have they conjured up for me today? Warily I peer into the bag, but I am pleasantly surprised at the contents. I spent the afternoon sorting them. It is not what I would call a unique collection considering there are large quantities of a single type. 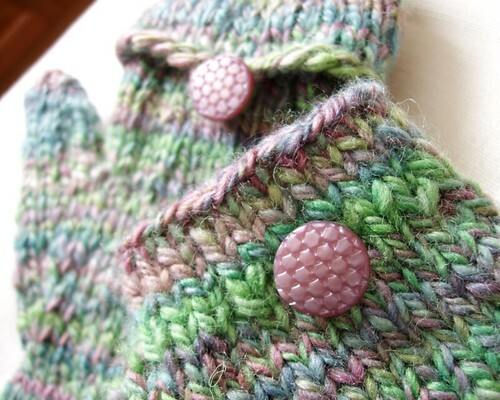 But if ever I decide to knit a floor length cardigan with buttons 1/4 inch apart, I’ll be set. I came across something else to dye. After doing a search on Etsy and finding someone selling “handdyed” buttons, I had to find out what this was all about. 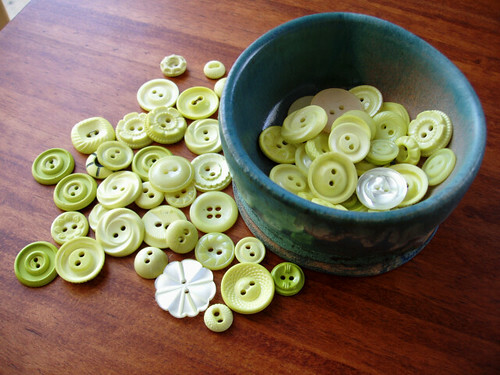 Next I went to Google and landed on this blog, where she talks about dyeing white buttons. Awesome! Because who doesn’t have 400 white buttons in their collection? They are a bit unavoidable. In her post, she uses liquid Rit, but I didn’t have any on hand, so I used my Lanaset dyes instead. It worked, but definitely not as good as the photo she shows as an example. I tried it three times. The first was orange and it came out very pale. The second I did yellow-green, which also came out light. And last I did dark blue with Jacquard acid dyes and it was the least successful. There must be certain types of buttons that take the dye better than others. Those buttons that are shiny and smooth didn’t change color at all. I may be inclined to continue experimenting. Boy, we just got dumped on for sure. Yesterday and today has been steady, though light, snow. Everything is white. It’s the kind that just piles up on things, so you can still see all the slats in the deck chair, but it looks 4 inches taller. Maybe a total of 7-8 inches? I must remind myself that I live in NE Ohio and it is January. 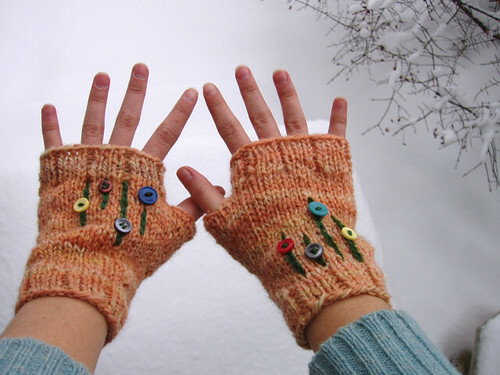 But even more exciting are these fingerless mitts that I just finished today. I completed the knitting last night, but I added the extra bits this morning. Not sure what the inspiration was. I just started doing some chain stitch and incorporated buttons because I have them. I’m pleased though. For a long time I’ve been wanting to try this, but just couldn’t find the right piece. Cheers! and thanks to Richard who took the photo. He stood behind me and held the camera in front of my face. Good thing he’s tall. i’m falling in love with my button collection. 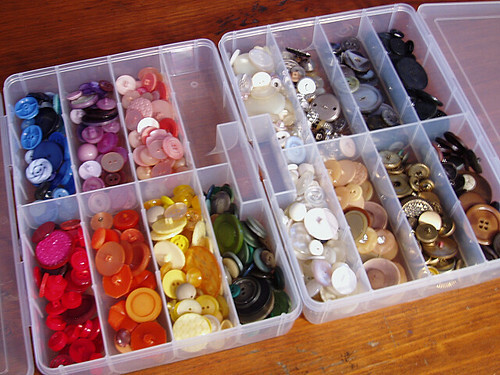 Yesterday I brought out my little plastic box of buttons and washed each one with a toothbrush (okay, just the ones in the lefthand box). It was an excellent way to reacquaint myself with my buttons, remind myself of what I have, and clean off any bits of grit. I had planned to do them all, but I got a little tired. Next I pulled out five neckwarmers that needed their buttons. Actually having a full palette to work with makes such a difference. Previously I would only buy buttons on an as-needed basis. It wasn’t nearly as fun or creatively stimulating. Now I can choose from all of these different colors and styles – I’m no longer limited to Jo-Ann’s mundane selection. Today I bought two new plastic storage boxes. They had larger compartments so my buttons could spread out and multiple. I arranged them as such: one box containing the neutral colors and one containing Roy G Biv. I just adore all the varying shades of one color all together. It makes me want to put buttons on everything! In all things, there are deficiencies. Areas that need to be improved upon, updated, increased, etc. 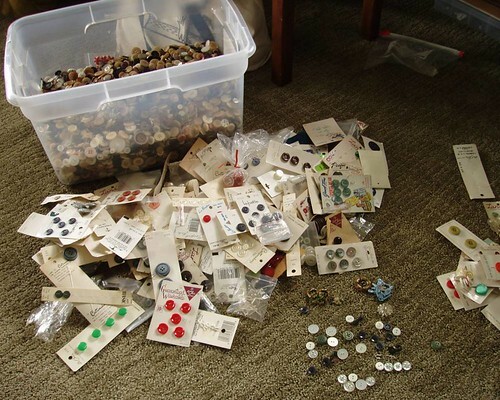 In my button collection, that area is the red section. I do not buy red buttons, I do not make red things. The person who had the color-coded button collection before me, she did not have many red buttons either. 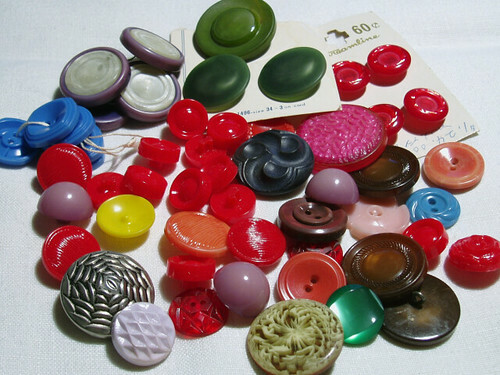 So, while at the Flea Market today (which was a beautiful day, by the way), I searched specifically to increase my stash of red buttons, and I think I achieved that goal. In addition to a few snazzy non-red ones. $5.00 for the lot. Another area in which I am lacking is linens. My housewares collection is primarily cookware, not so much textiles. 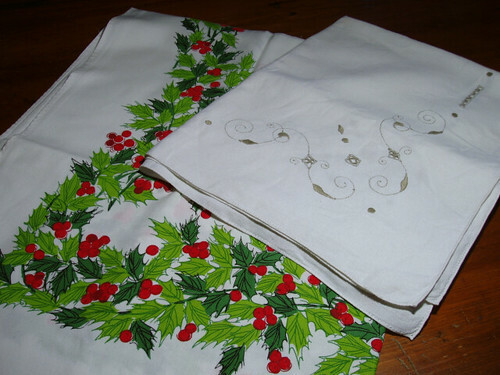 Whenever I’m out, I always look for table clothes, but they are either ugly or too expensive. Today I found these two and got them for $8.00. I liked the holiday one because it wasn’t too ridiculous – covered in snowmen and trees for instance. The other was nice and plain for regular occasions. I also bought some other items, but they haven’t been sufficiently cleaned yet.